When its really hot and humid in Mombasa, the last thing hubby and I want for lunch is curries, parathas and rice. I try and make exciting salads which are filling and yet healthy. As I’ve mentioned before I like my salads to be as colourful as possible. I like falafel but having it with pita bread can be heavy on the stomach during the hot season. I hate frying food during the hot season and will only fry if I have guests over. I baked the falafel, but it was refusing to turn that nice golden colour. I didn’t want to keep on brushing more oil on it. However, the baked ones tasted really good with the salad. However, if you want to fry them then please go ahead. To make it a filling meal (something that will not have hubby running to the fridge in 1 hour!) I added quinoa. Quinoa is a super food as its labelled by experts. Its gluten free, high in protein. It contains flavonoids (plant antioxidants) which are good for health, high in dietary fibers,its a good low GI option, good source of iron and magnesium. We all know that chickpeas too are good for health.It helps in controlling diabetes because its high in dietary fiber and a good low GI option. Its a good source of iron,magnesium, phosphates, calcium, zinc, manganese and therefore very good for the bones. Including chickpeas in your daily diet is prevents constipation. 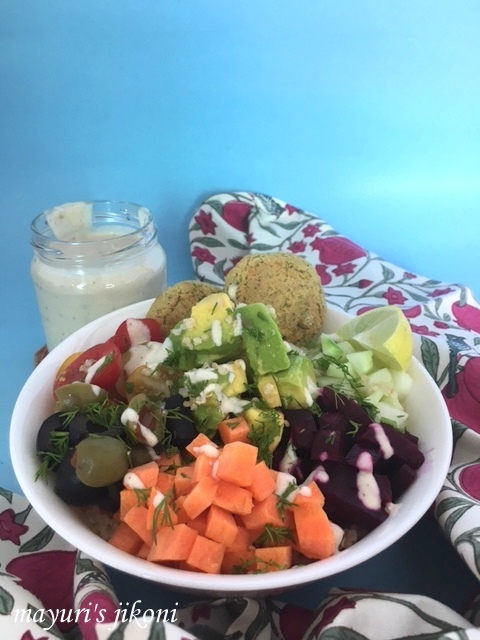 With so many health benefits why not make this falafel salad bowl a weekly part of your diet. I do, and I vary the vegetables I use. Sometimes the dressing too is different, only yogurt or even a left over green chutney. Put the chickpeas, herbs, garlic, oil, lemon juice, tahini paste in a food processor and process the mixture till you get a coarse paste. Remove the mixture into a bowl. Add the remaining falafel ingredients except the oil for brushing. Brush some oil on it. Take a tablespoon of the mixture and roll it into a ball. Flatten it slightly between your palms. Put the falafel on the prepared tray. Repeat steps 7 and 8 with the remaining mixture.You will get about 10-12 falafels. Brush oil on top of the falafel. Bake for 15-20 minutes, flipping the falafel half way. Brush with oil. Mix all the ingredients well in a bowl or measuring cup. Divide the quinoa between the 2 bowls. Now arrange the salad ingredients on top. Serve with lemon wedges and the Tahini Yogurt Dressing and enjoy a healthy but filling lunch. You may use the remaining falafel to use as stuffing for pita bread. The baked falafel taste a bit dry, but then they are healthier. Can fry them or shallow fry them if you wish. Use salad ingredients of your choice. Instead of quinoa you can use couscous, brown rice or just vegetables. I didn’t add oil to the dressing. To cook quinoa, measure 1 cup quinoa and wash it under running water, rubbing it with your fingers.Add 2 cups of water into a pan. Add the quinoa and let it cook till done.Add ¼ tsp salt if you want when the quinoa is cooking. LOVE falafel and this protein packed salad looks so filling and delicious. Reminds me of the Buddha bowl. Looks yum healthy and filling. The salad bowl looks interesting and a nice filling meal . Great pick. That is one fantastic filling bowl which I would love to have. Omg, wat an alluring falafel salad bowl, just prefect to finish a meal. Quite a satisfying salad bowl. This is definitely the type of meal I enjoy in summer when I want a salad but also want something filling enough in it so that we're not hungry a short time later! Lovely and healthy too. Such a lovely and healthy bowl with falafel.. Can you pass me a bowl!! oh wow – filling and healthy! We love falafels and the idea of baking them is really nice. Love this wonderful and filling salad bowl.